Read David Kennedy’s interview with Eugene Schwartz on WaldorfToday.com. Eugene answers a number of incisive questions about the role of online Waldorf conferences and the future of Waldorf education. Click here to view their conversation. You choose any 14-day period convenient for you. The intense summer conference schedule means that a great deal of meeting time must be squeezed into a few short weeks and a handful of conference locales. We frequently have to lament that our conference presenters could only be in one place at one time . . .
. . . until now, that is! 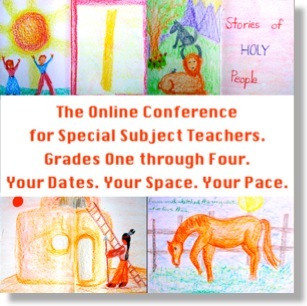 Today’s Internet makes it possible to overcome at least some of the limitations of space and time, and it makes it possible to offer a Conference for Special Subject Teachers – online! Five years of enthusiastic participation by Waldorf teachers worldwide have proven that the online format is an effective and efficient way to gain the breadth and depth needed for the school year to come. And yes, there will be handouts. PDFs of relevant Grades One through Four resource material will be available for you to download during the conference weeks. Don’t worry! The conference “interface” is completely user-friendly! Our conference support team is as close as an email, text, or phone call. The over 1400 participants in our five years of Online Conferences have experienced very few difficulties, and most were resolved in just minutes. You do need good broadband access to the Internet, and we recommend Safari, Firefox, and Chrome as the most reliable Web browsers for this conference. The fee for the conference week is USD$300.00. That is all that you pay. Since you are participating from your home or school, there are no travel expenses, no accommodations expenses, no dining expenses. Many of you would have to considerably more than this amount to attend a single grade conference in a training center. Click here for a comparison of conference expenses. In these difficult economic times, such savings can make a significant difference. And no other Waldorf conference will allow you to leave such a small carbon footprint.